First pieces of character LoDing implemented for (Legionnaire and Ranger), please report any oddities with character movement and animations. Better handling of multiple netcode messages clogging the message queue. Tweaked some props in Keep. There are now three diminishing return categories for crowd control (CC). Hard CCs such as Knockdown/Stun. Movement CCs such as slow/pushes. Attack CCs such as Suppress/Blind/Cooldown Increases. The familiar gold shader is still used to convey immunity to Hard CCs. Movement and Attack CCs are messaged via buff icon. Verify new stat mods still alter projectile lifetime and velocity for Confessor + Ranger. Combat Principles Offense and Defense skills now correctly add and remove duration to all CC’s. Added 37 pieces of Flair to Knight basic attack animations. Updated timing and damage values on basic attacks to match new animations. Eternal Rage can now be used on the move. Animated left click melee attacks to be split body. 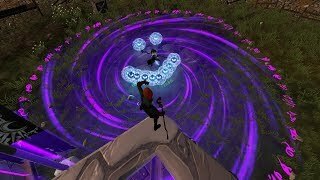 Sustain now animated as a split body. Added jump land animations for both bow and dagger mode.